The cassette player. The walkman. The discman.. All of these examples fail in comparison to one of the best could-have-beens from the early eighties; the Bone Fone. 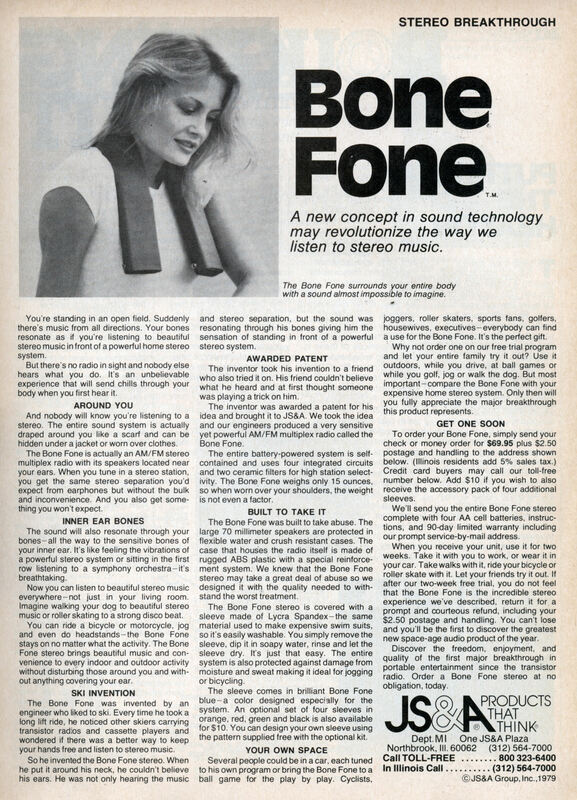 The fantastically named Bone Fone was not actually a phone, but a spandex covered AM/FM radio that was meant to been worn like a bone rattling musical scarf. Essentially it was a shockproof, waterproof AM/FM radio connected to a battery pack with a flexible plastic tube which contained two 70 millimetre speakers that would sit on your collarbone. The sound was supposed to vibrate your bones from your collar bone to your inner ear to create a barrage of sonic delights, the likes of which the world has never heard. The sleek, timeless design was made to be worn under your clothes and offered “the same stereo separation you’d expect from earphones but without the bulk and inconvenience…” The sound from the Bone Fone’s speakers would apparently “resonate through your bones, all the way to the sensitive bones of your inner ear” and is said to have mimicked that of a powerful stereo system or a front row seat at a symphony orchestra performance. Beyond providing the amazing sensation of having a powerful stereo system inside the confines your own head, the Bone Fone was “built for abuse” and couldn’t even be heard by the people around you. You could listen to the play by play on your Bone Fone at the ball game and nobody would ever know! Demonstrate User Diversity: To prove that your product is for absolutely everyone, mention every single kind of person you can think of. Talk about cyclists, joggers, roller skaters, sports fans, golfers – and don’t forget the housewives and executives. And now, without further adieu, enjoy what can certainly be considered some of the worst advertising this world has ever seen.